Three varieties of hopniss. Top to bottom, wild from New Jersey, wild from Virginia, LSU improved variety. Groundnut or hopniss (Apios americana) is a member of the family Fabaceae, along with common garden beans and certain tuber forming plants like jicama and ahipa, to which the relationship is more apparent. This plant goes by a lot of names, most of which are not particularly apt. 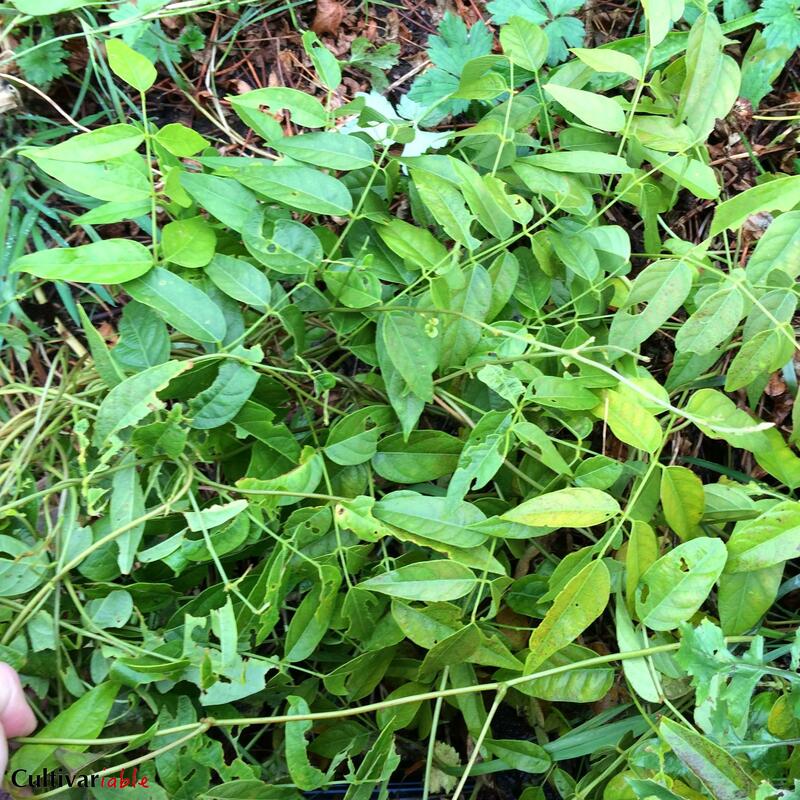 I have tried to popularize the name Lenape name hopniss, but the web stats are clear: people are searching for groundnut but 20 to 1 or more, so I have returned to calling the plant groundnut in this guide. Groundnut is a name that can be both confusing and misleading, since the peanut is more commonly known as the groundnut and this plant does not produce a nut in the ground or, indeed, any nuts at all. Other common but sometimes poorly chosen names include openauk (another native American name), Indian potato, potato bean, vine bean, or American hodoimo (hodoimo is a related Asian species). What an unwieldy bunch! Hopniss sounds a lot more appealing, but I’ll stick to groundnut (mostly). Grountnut is a climbing vine and varieties may grow from 3 feet to more than 20 feet tall in a favorable climate. Six to eight feet is a typical height for first year plants of most varieties that I have seen. That assumes that the plant has something to climb; otherwise, it will just pile up on the ground. Underground, the plant forms long rhizomes with edible tuberous swellings that look like strings of beads. Of course, the “beads” may grow to be pretty large, an inch or two in unimproved varieties, but up to eight inches in some of the LSU improved types. I have read claims that very old tubers may sometimes be as large as a football, but I’ve never seen one nearly that big. In summer, the plants produce clusters of pink or purple flowers. 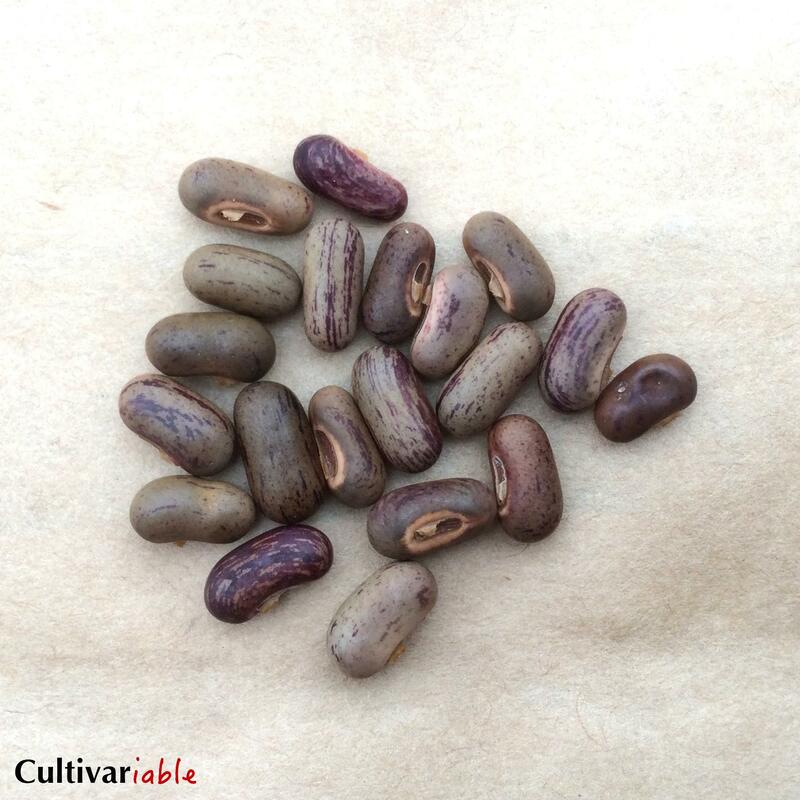 If the variety is diploid and has a suitable pollinator, it will form beans. Groundnut tubers are starchy and reminiscent of potatoes, although blander in my opinion. In the wild, groundnut grows along the banks of rivers and lakes, usually climbing trees and shrubs. As a member of the pea family, it is nitrogen fixing, which is certainly a nice feature in a root crop. Groundnut is Native to North America and is widespread east of the Rockies, particularly along the eastern seaboard and the southeast. It is perhaps best known as one of the plants that native Americans introduced to the Pilgrims, making the difference between starvation and survival in those first few years. It is debatable whether groundnut is a domesticated or wild crop. It was at least wild collected by native Americans, but they may have also done some work to improve it. If so, this was followed by a long period during which groundnut was largely ignored as a food plant, until it began to attract some attention in the latter half of the 20th century, which led to breeding projects at several universities, and most prominently at Louisiana State University, where a number of improved varieties were produced. Following the famine, groundnut was exported to Ireland and other European countries, but failed to catch on, as has been the case with so many New World root crops. In the case of groundnut, the main problem was that it fails to yield significantly as an annual. This makes it hard to fit into traditional row cropping. In the 1980s and 1990s, Louisiana State University hosted a groundnut breeding project that turned out a number of superior varieties. As we have seen so often with university breeding programs, the budget was eventually pulled and the project ended without ever introducing the new varieties. Happily, some of the people involved took the new varieties with them and at least some of them have been preserved. I grow two LSU varieties. The identities have been lost, but they are both much larger and higher yielding than wild groundnut. There may be more than a dozen LSU varieties that still exist, but tracking them down is a challenge. Although they taste similar to potato, groundnut tubers have a very high fraction of protein, which probably makes them a healthier staple than starchy roots. Although the tubers are the part of primary interest, all parts of the groundnut plant are edible, including the leaves, flowers, and beans. Beans are only produced on diploid plants, so they won’t be found on wild collected plants from the northern part of its distribution, as they are predominately triploid. The tubers are starchy, with a very dry, floury flesh. The tubers are usually peeled, as the skin is somewhat woody, particularly in older tubers. It slips off fairly easily when they are boiled, but can be removed with a vegetable peeler for any other method of preparation. As with many plants that have been only lightly domesticated, groundnut can present digestive difficulties for some people. A small fraction of people who eat groundnut will experience symptoms ranging from light abdominal cramping to extreme abdominal pain that lasts for hours and is accompanied by diarrhea and vomiting. Because of this, I recommend starting with small portions and keeping them small for the first ten times that you eat it. It appears that most people who have problems will not experience symptoms the first few times that they eat groundnut, but most will within the first ten times. This pattern suggests some sort of allergy or other immune response, but very little is known about this reaction. There are several possible causes. Groundnut contains carbohydrates in the form of oligosaccharides, which cause gas and bloating in some people that can be quite unpleasant. As a member of the pea family, groundnut also contains lectins, which cause illness when beans are undercooked. It is possible that short cooking time does not sufficiently reduce the lectin content, causing bean poisoning. I have had a bad reaction to groundnut and can attest that it is no fun at all. I now always boil my groundnut tubers for 30 minutes and I haven’t had a repeat, although that’s no guarantee that it won’t happen again. Although it is more productive when trellised, groundnut will grow just fine in a pile on the ground. In it’s native environment, groundnut is a plant that grows in partial shade with access to plenty of water. This is not necessarily ideal for production, but gives some clues about growing conditions. In areas with hot summers, it may benefit from partial shade. In areas with cool summers, it definitely requires full sun and will probably benefit from warmer microclimates, such as trellising along a south facing wall. 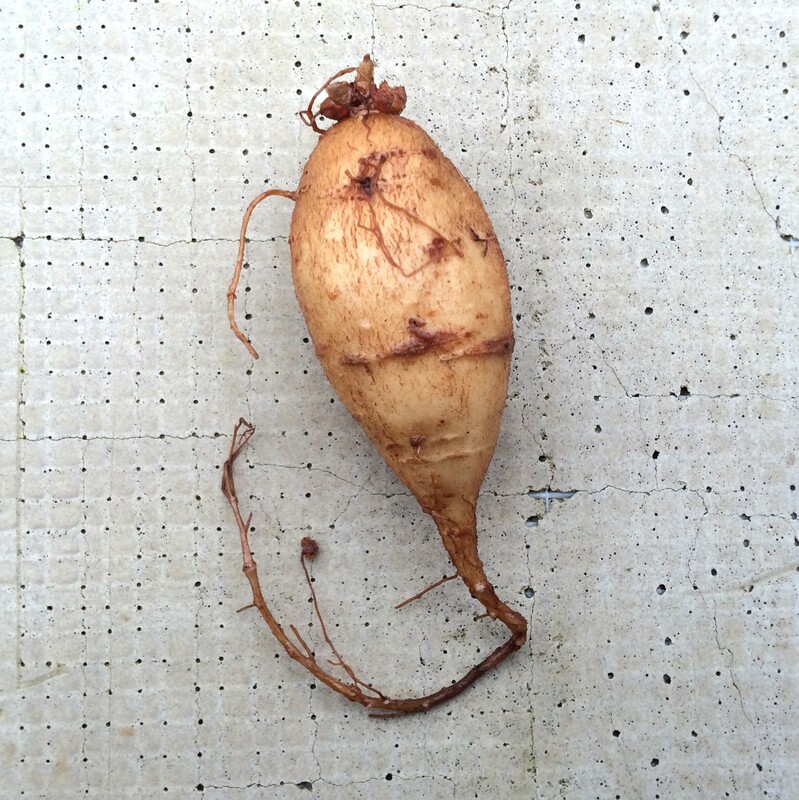 Like other root crops with long rhizomes (Jerusalem artichoke, for example), groundnut can be a bit hard to control. 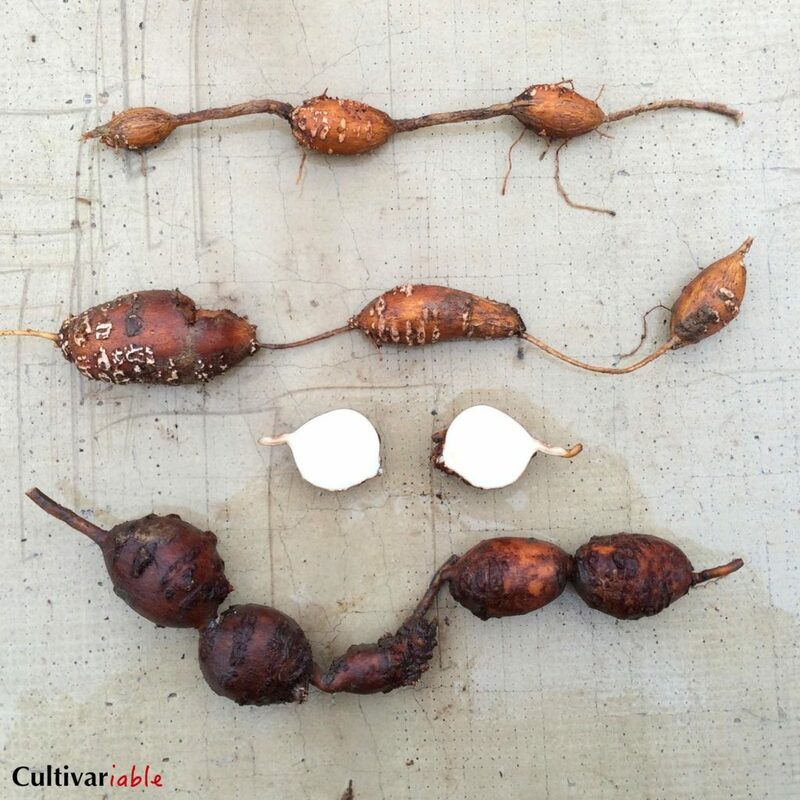 It is difficult to find all of the tubers and new plants can form even from small bits of rhizome. It isn’t an ideal candidate for annual rotation with other crops. I recommend setting aside a permanent area for groundnut cultivation. Groundnut can be propagated from both tubers and seeds, but tubers are much more common. The tubers will keep about as well as potatoes in cool, humid conditions. They also keep very well in plastic bags of soil in the refrigerator. Not much is know about growing groundnut from seed, but the seeds are beans and will probably store just as more common garden beans do. Groundnut rarely produces good yields in a single growing season, although it may produce a reasonable crop in warm summer climates. In the Pacific Northwest, it is best to let it grow for two or possibly even three years. Because of this, you will want to do some planning before planting. If you want to harvest groundnut every year, you will want to make room for staggered plantings. The tubers are very cold tolerant and you can probably plant them at any time of year when the soil can be worked in zone 5 or above. I plant them about four inches deep, on 12 inch centers with trellising or 36 inch centers without. If you live in a really cold climate, you can mulch over them for a bit of insurance. Although it can be grown without any support, groundnut will yield more with something sturdy for its vines to climb. Although the plant is perennial, groundnut vines die back at the end of the growing season, so tall annual crops can provide a good trellis for it. Some plants that have been used succesfully are corn, sunflowers, and Jerusalem artichokes. Many root crops that can be grown as perennials also serve as annuals, but groundnut really yields best as a perennial on a two or three year growing cycle. Groundnut takes several years to reach maximum yield. In a climate with warm summers, you will probably have a batch of good sized tubers after two growing seasons. In milder climates, it make take three. While groundnut may be harvested at any time of year, the two most common times are in the fall after the vines are killed by frost or in the spring once frozen soil thaws out. 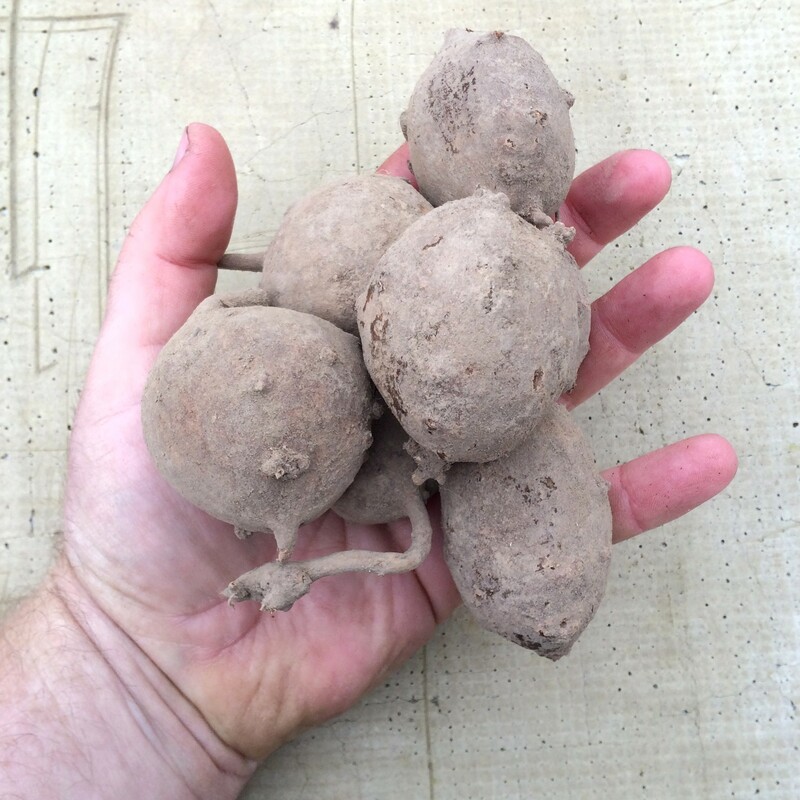 Groundnut tubers are form pretty shallowly, usually in the top six inches of soil. Unfortunately, the rhizome is too fragile to come up when uprooting the plant. You will need a shovel. I have found that the radius in which the tubers are found is about 1 foot per year, with a maximum of three feet. Of course, groundnut only grows about eight feet tall in my climate and may easily grow to double that in warmer climates, so perhaps the rhizomes will spread farther as well. Groundnut tubers store pretty much like potatoes. Keep them in a cool, humid, and dark environment and they will remain edible for months. I’m not aware of any information about preserving whole tubers. They can probably be canned like potatoes, but I don’t know of anyone who has tried it. The most common way of preserving groundnut tubers is to dry them and grind them into flour. While this flour doesn’t contain gluten and therefore cannot be used to make bread alone, it can be incorporated with other flours, much as potato flour is. The flour also makes an excellent thickener for soups and stews, much like arrowroot. Groundnut seeds. 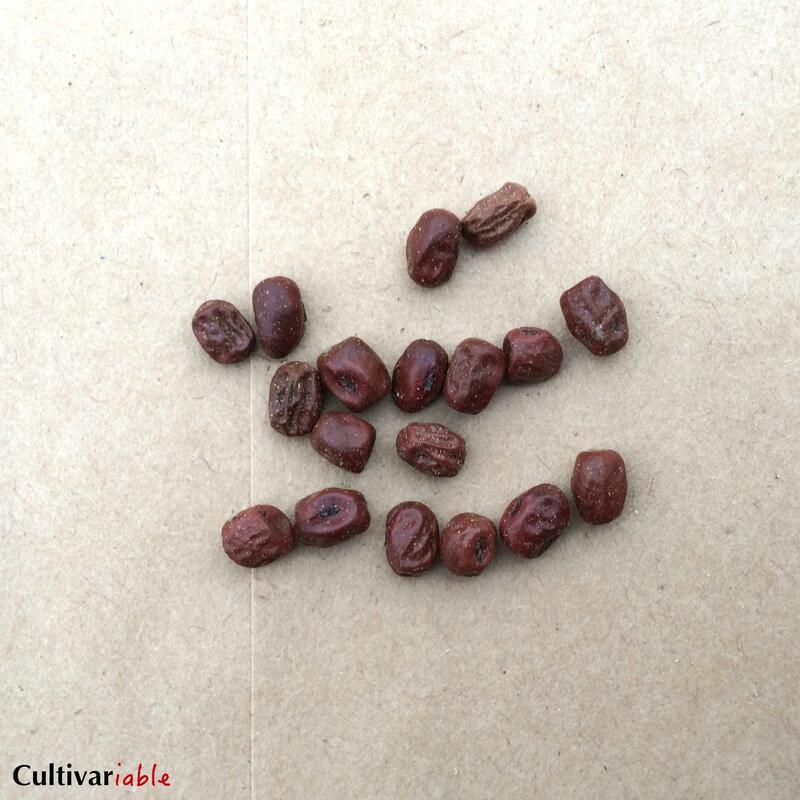 The wrinkled surface appears to be normal for fully dried seeds. Groundnut is most commonly started from tubers. This provides about a year head start over growing from seed and ensures that the variety will be true to type. Groundnut can be propagated from cuttings and tissue culture protocols have been worked out as well, but it is such a prolific producer of tubers that most people will find the alternatives unnecessary. There are two natural ploidy levels of groundnut: diploid and triploid. The diploids are typically found in the southern parts of its range and they will produce seeds with cross pollination. The triploids make up the bulk of the northern population and, like most triploid plants, they are sterile. They do not form pods or seeds. In warm summer climates, groundnut may flower as early as July, which is convenient for saving seed. In cooler climates, it may not flower until September. For that matter, some varieties may not flower at all. Here in the maritime Pacific Northwest, I see flowers in September in warmer years and often no flowering in cooler years. The seed pods that rarely form are usually ruined by frost as a consequence of the late flowering, but I managed to get some mature seed for the first time in 2016. Groundnut has two very similar, edible relatives. A. fortunei, known as Hodoimo in Japan, is distributed along the northeastern coast of Asia, primarily in China, Japan, and Korea. While the plant is similar in form to groundnut, it typically sets a single tuber. The tuber grows larger than most groundnut varieties (certainly larger than the wild varieties), but seems less promising for development since the yield is so much lower. It may be a better performer in cool summer conditions than groundnut, which makes it an interesting possibility for hybridization. A. fortunei doesn’t appear to be available in North America at the moment, although it has been grown here in the past. Perhaps some will turn up. A. priceana, Traveler’s Delight or Price’s Groundnut, is a much less common cousin of groundnut that is found primarily in Tennessee and in surrounding states to a lesser extent. Like A. forunei, it produces a single tuber, which can grow larger than groundnut tubers in the summer heat of Tennessee, but grows depressingly slowly here. This is a threatened plant and you probably should not forage for its tubers in the wild. It does set seed though and if you live in an area where it grows, you might collect some. As far as I can tell, neither the USDA or any other institution holds accessions of A. priceana seed and it seems like a really good idea to collect some before it disappears. I hope that we can one day offer seeds, but our plants have not flowered yet. Perhaps in some unusually warm year, they will. Packets contain three individual tubers tubers (not chained with rhizome). They may be of any size over 1/2 inch, but are generally about an inch in diameter. We may occasionally include some smaller tubers. They don’t store as well as tubers over 1/2 inch, but if they make it to planting time, they will start a new plant just as well as the larger tubers.